numbers do not relate to time at all. One of these is Revelation 13:18.
or forehead and to control certain commerce. dragon, PAGAN ROME, who fostered the whole system. the highest unit in each pair is 6.
was chosen to mark the whole Roman politico-religious system in this prophecy. and wisdom in IDENTIFYING THE MAN OF SIN SYSTEM and keeping separate in spirit from it. others regardless of whether they understand (or believe) it or not have been marked. 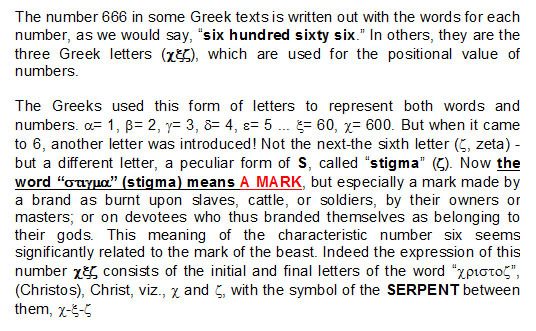 the Greek is 6oo, 6o, 6.
indicates the number of a certain man and his number is 666.”. people," and of this sort his Jewels have been from, the twelve disciples and since. Revelation) Let us try, then, to apply these figures in English. 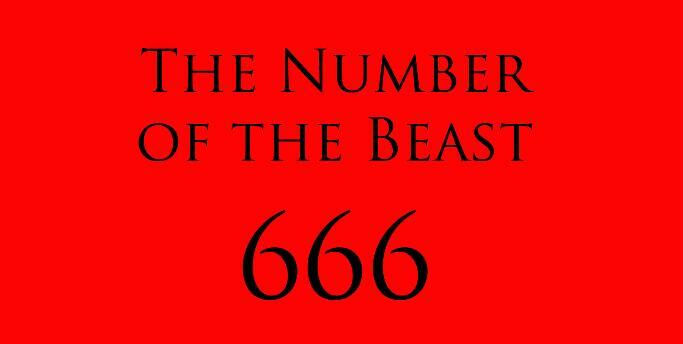 Holy Catholic Church" = 666.